Me, my kids, and my husband are all big water drinkers. I don’t keep juice or soda in the house, and I like that my kids actually prefer water over sugary drinks. We get filtered water from our refrigerator during the course of the day, but I’ve been in the market for either a sink filter solution or a pitcher solution, so that I could have a large amount of filtered water at the ready. So the timing was perfect for the opportunity to review a pitcher from Clearly Filtered – a company dedicated to providing clean and healthy water to people all over the world. 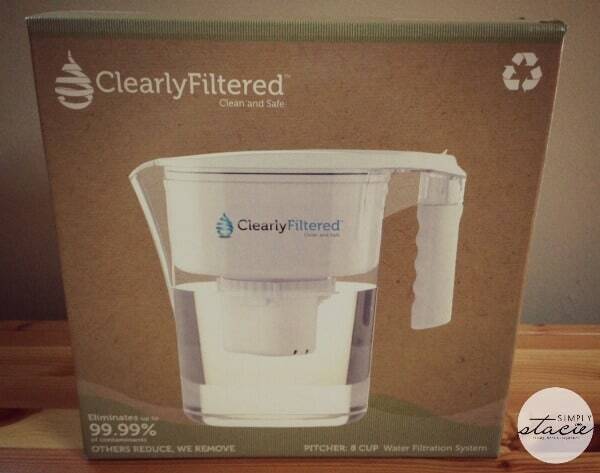 I received a Pure Filtered Water Pitcher for review from Clearly Filtered. This pitcher is meant to fit in your fridge to keep clean filtered water at your fingertips. When I opened the box I had everything I needed for up to 200 gallons of filtered water. The box contained the pitcher, the filter unit, a sink attachment for the initial filter flushing, and a tool to help tighten the filter to the pitcher lid. The only prep work needed to start using the pitcher is to flush the filter attachment – and with the sink attachment, all I had to do is twist the filter to the special sink attachment, put it on the faucet, and let it run for a few minutes. Then I took the filter off the sink attachment, twisted it into place on the pitcher, and filled it up. I put the pitcher in the fridge, and in a short amount of time, the pitcher was full of filtered water. My husband and I agreed, we both loved the taste of this filtered water. 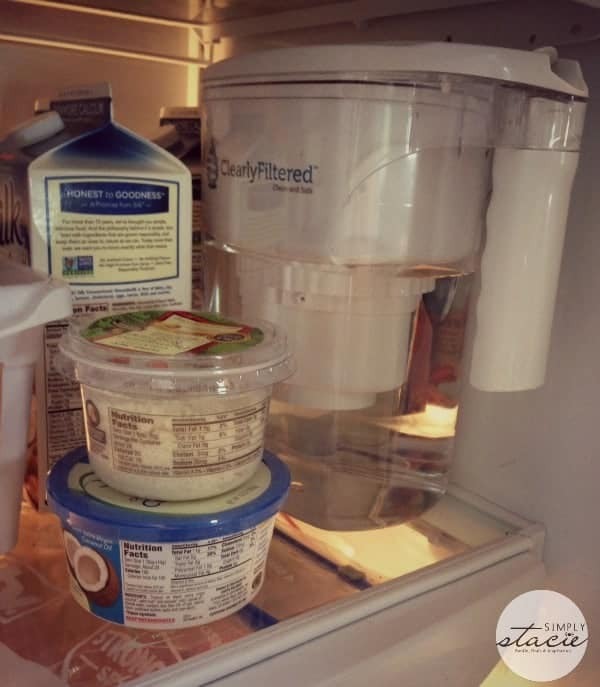 I like the size of this pitcher – it’s thin and lightweight, and fits nicely in my standard fridge. The pitcher itself is made from 100% BPA free, non-leaching Tritan plastic. The filter is designed to not just reduce toxins in drinking water, but to eliminate them – from Chlorine, to Chromium, Lead, to Mercury. If that doesn’t impress you, the cost will – it’s just .35 cents per gallon! So by using this pitcher, you are helping save the environment by eliminating the need for plastic bottled water, you are helping yourself and your family by providing clean, healthy water, and you are saving money in your wallet too! I like this pitcher and would recommend it to anyone looking for this type of water solution for their family. This pitcher sells for $69.95 on the Clearly Filtered site. Clearly Filtered is a company passionate about helping others achieve a healthy lifestyle by ensuring that the water they drink is clean and pure. They believe that clean water is a basic human right and they intend on doing everything that we can to make sure that people don’t go thirsty, which is why they donate a percentage of their profits to charity. 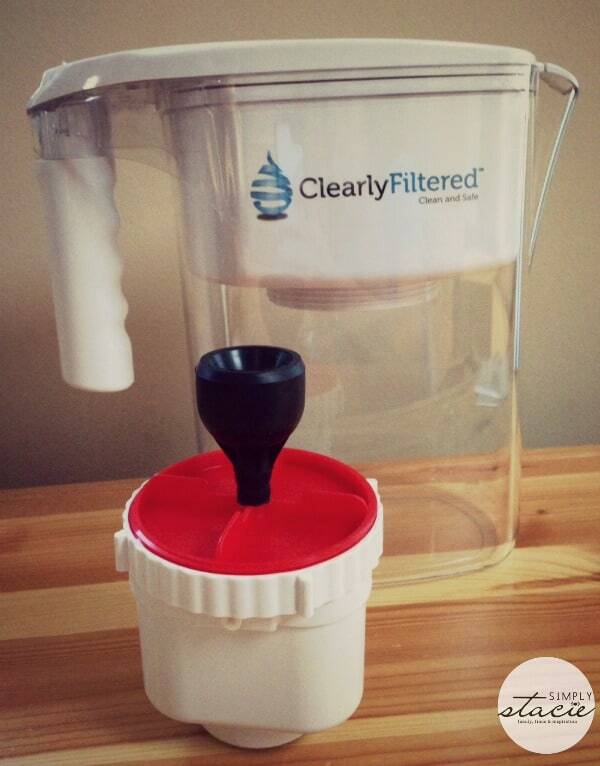 To learn more about Clearly Filtered and the products they sell (including portable filtered water options), check out their website. You can also find them on Facebook, Twitter, and YouTube. Be sure to sign up for the newsletter on the bottom of their homepage to be in the know for special promos. I learned they have free shipping!!! I learned their mission is to provide clean water all over the world. I learned they donate a percentage of the company’s profits to charity. I admire their commitment to seeing a day when clean water is accessible to all, worldwide. How impressive! I like the stainless water bottle. I like that the filters clean my water. I like the way it fits in the fridge. I like the insulated stainless filter bottle. This would be great to have with our lunch boxes . They have a VIP filter program. I liked the stainless steel filtered bottle as well! I like the Insulated Stainless Filter Bottle. I found out that you can get a discount by joining the VIP Filter Program. I like the stainless steel filtered water bottle. I like the Athlete Edition Filtered Bottle. I like the free shipping on domestic orders. Our mission is to provide clean, safe drinking water to people all over the world. I love the Insulated Stainless Filter Bottle. I could use a few of them! Love the free shipping and insulated bittles!!!! No need for plastic! I learned the filters are cheaper and last longer even though they filter out more things. That it’s filter life is 3x more than my Brita I use! Thanks for the giveaway! It has a 99.9% reduction in many contaminants, including chlorine, bacteria, e. coli and salmonella. I like the stainless steel bottles!